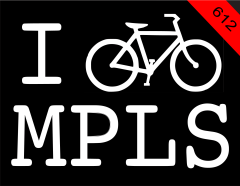 IBIKEMPLS.com - it's where I get all my news: October is Rideshare to Work Month! Please partner with us to promote Rideshare to Work Month aimed at encouraging employees to share the ride to work, saving money, reducing stress and helping the environment. If your employees carpool just one day during the month of October, we enter them into our prize drawing to win a $500 Gas Gift Card or Garmin GPS! We offer FREE ride matching assistance to help people find someone to carpool with. Schedule a Commuter Fair with us, or simply forward this Rideshare to Work Month flier to your co-workers. It is time to Nominate yourself or your company for a regional Commuter Choice Award! Every year the region acknowledges companies and individuals who promote commuting options. Awards recognize outreach efforts, achievements and programs designed to reduce drive-alone traffic that were completed between October 2010 and September 2011. Please reply to this email to receive a nomination form. Nominations are due by October 10. Click here for more information. The 2011 Work/Life & Flexibility Expo was designed to offer an interactive and cost-effective way to tackle an organization's challenges with new ideas and shared experiences. The event will feature the largest number of practitioners, researchers and business leaders ever. In addition, conference attendees will have the opportunity to earn HRCI credit, build new relationships with peers and discover practical business tools they can begin to use immediately. For more information on speakers and breakout sessions or to register for the Expo click here. Encourage your employees to think about extending their bicycle commuting season past late summer/early fall, they can attend our free Winter Biking Class to learn tips on biking in the dark, what to wear, how to stay warm, etc. Click here to view the Winter Bike Class Flier. Commuter Services staff are happy to schedule an onsite commuter fair at your workplace to promote Rideshare to Work Month and extending the bicycle commuting season. We also encourage you to forward the Rideshare to Work Month flier to your co-workers. Everyone’s effort adds up to faster flowing traffic and cleaner air!